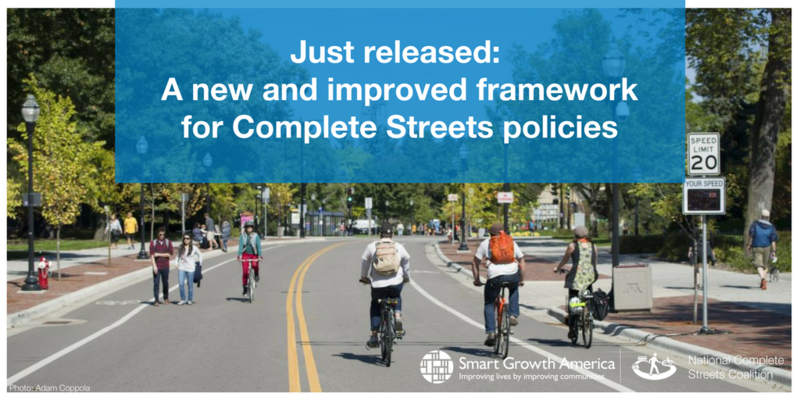 To conclude Complete Streets month at Smart Growth America, we’re proud to publish the brand new policy grading framework and scoring methodology. These changes come after our Steering committee voted to approve the framework in 2017. For months a group of national stakeholders, consisting of engineers, planners, researchers, and advocates, worked to revise the policy elements and truly raise the bar for what Complete Streets look like in practice. So it is only right that we spent the past month highlighting each of these revised elements and gaining a deeper understanding of the essence of Complete Streets moving forward. Beginning in 2018, will be using this revised policy grading framework to analyze and rank Complete Streets policies. Why change the policy framework at all? In 2016, National Complete Streets Coalition adopted a strategic plan that called for increased implementation and equity in Complete Streets policies and practices. When grading the policies, we realized the ideal elements did not match the current realities and transportation needs in communities. Policies are the first step to safe, accessible, convenient streets for everyone regardless of age, race, ethnicity, income, physical ability, or how they choose to travel. The framework that we are releasing today includes more requirements and steps to implement Complete Streets to be considered an ideal policy. Read the full policy grading rubric and scoring methodology, available now. For all policies adopted in 2017, we will score each jurisdiction’s policy using the old grading rubric and include those scores in the Best Complete Streets Policies 2017 report appendix.